The USSR ship NADESHDA KRUPSKAJA leaving the landing stage. SHE WAS BUILT IN 1963 with a 5,261 grt. 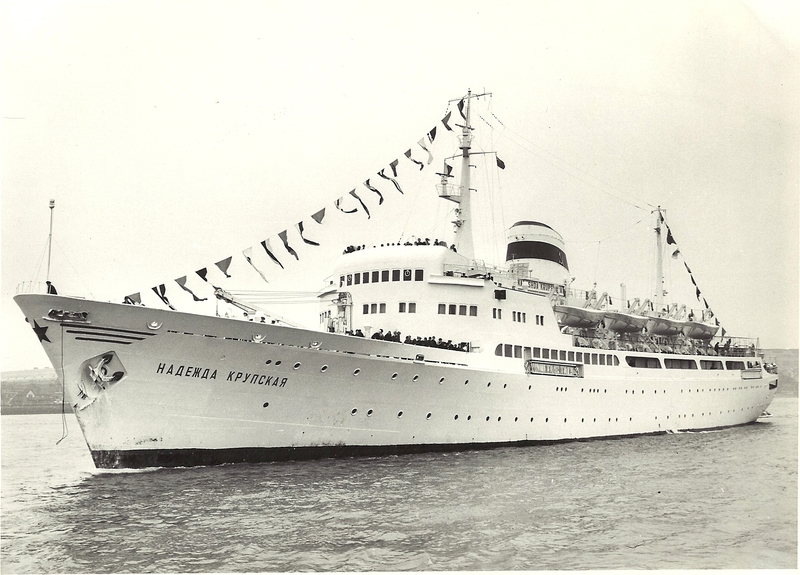 The Soviet liner NADESHDA KRUPSKAJA, named after a Bolshevik revolutionary, and wife of Lenin, entered service in September 1963 on a regular service from Leningrad to Helsinki, Copenhagen, Tilbury and Le Havre. She was built at Wismar in East Germany, of 5261 tons gross, and a capacity of 333 passengers. Owned by the state and operated by Baltic Shipping Co, of Leningrad, the liner was one of more than 20 “sisterships” that started with the MIKHAIL KALININ, which made its first appearance at Tilbury in 1958. With changes in passenger carrying operations, the NADESHDA was surplus to requirements in the 1970s, and in 1975 was transferred to the Soviet navy for use as a troopship and for other naval purposes under the name KUBAN. 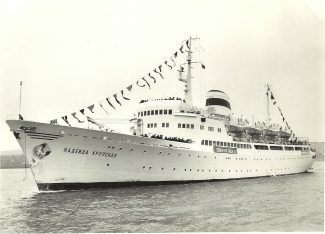 It was sold out of the fleet in 1992 to a Bulgarian hotel operator and became a static hotel ship at Varna on the Black Sea for the next six years. She was broken up at Aliaga, Turkey, in 1998.